Tom Finn, “Abdel-Malek Al-Houthi: from Shadow Rebel Leader to Kingmaker,” Middle East Eye, September 26, 2014, http://www.middleeasteye.net/in-depth/features/abdel-malek-al-houthi-shadow-rebel-leader-kingmaker-988988591. He has served as the group’s military leader since 2004, when then-military leader Hussein Badr-al-Din al-Houthi—Abdul-Malik’s brother—was killed by Yemeni security forces.Tom Finn, “Abdel-Malek Al-Houthi: from Shadow Rebel Leader to Kingmaker,” Middle East Eye, September 26, 2014, http://www.middleeasteye.net/in-depth/features/abdel-malek-al-houthi-shadow-rebel-leader-kingmaker-988988591. Badr-al-Din—Abdul-Malik’s father—remained the group’s spiritual and political head until his death in 2010, at which point Abdul-Malik al-Houthi became the group’s leader in every regard.“Yemen’s Abd-al-Malik al-Houthi,” BBC News, October 3, 2014, http://www.bbc.co.uk/monitoring/yemens-abd-almalik-alhouthi. Since assuming military control over the Houthis in 2004, Abdul-Malik al-Houthi has commanded the Iranian-backed rebel group through numerous cycles of conflict with the Yemeni military.Ahmed Mamdouh, “Abdul Malik Al Houthi: The Shiite Thorn on Yemen’s Side,” AlBawaba (Egypt), March 25, 2015, http://www.albawabaeg.com/52258. He became the commander in charge of negotiations with the Yemeni government in 2007.“Yemen’s Abd-al-Malik al-Houthi,” BBC News, October 3, 2014, http://www.bbc.co.uk/monitoring/yemens-abd-almalik-alhouthi. Following the Arab Spring in 2011, Houthi shifted his rhetoric from rants disparaging the U.S. and Saudi Arabia to speeches that appealed to a broad range of Yemeni citizens. His popularity grew as he began to criticize high gasoline prices and Saudi drone strikes.Tom Finn, “Abdel-Malek al-Houthi: from shadow rebel leader to kingmaker,” Middle East Eye, last modified February 13, 2015, http://www.middleeasteye.net/in-depth/features/abdel-malek-al-houthi-shadow-rebel-leader-kingmaker-988988591. In September 2014, the Houthis—under Houthi’s leadership—attempted to overthrow the Sanaa-based government of Yemeni President Abed Rabbo Mansour. In order to quell the violent protests and Houthi blockades in the capital, the government chose to consult with the rebels in appointing new government officials.Shuaib Almosawa, “U.N. Reports Yemen Deal With Rebels,” New York Times, September 20, 2014, http://www.nytimes.com/2014/09/21/world/middleeast/peace-talks-with-rebels-falter-in-yemen.html. In November 2014, Hadi announced a new list of government ministers that included Houthi officials and supporters.“Yemen’s President Forms a New Government,” Stratfor, November 17, 2014, https://www.stratfor.com/analysis/yemens-president-forms-new-government. However, the Houthis rejected the proposed government structure, disapproving of certain appointees who had served in previous governments.“Yemen’s President Forms a New Government,” Stratfor, November 17, 2014, https://www.stratfor.com/analysis/yemens-president-forms-new-government. “Treasury Sanctions Instigators of the Violent Takeover of Yemen,” U.S. Department of the Treasury, April 14, 2015, http://www.treasury.gov/press-center/press-releases/Pages/jl10021.aspx. Houthi reportedly maintains a guarded lifestyle, moving regularly between safe-houses and refusing most interviews due to safety concerns.Tom Finn, “Abdel-Malek al-Houthi: from shadow rebel leader to kingmaker,” Middle East Eye, last modified February 13, 2015, http://www.middleeasteye.net/in-depth/features/abdel-malek-al-houthi-shadow-rebel-leader-kingmaker-988988591. 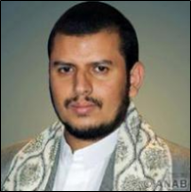 He is notorious among analysts and journalists for his insistence on privacy.“Abdel-Malek al-Houthi: provincial rebel turned Yemen powerbroker,” Reuters, January 21, 2015, http://www.reuters.com/article/us-yemen-security-houthi-idUSKBN0KU1MF20150121. Abd-al-Malik Badr-al-Din al-Houthi “Yemen’s Abd-al-Malik al-Houthi,” BBC Monitoring, October 3, 2014, http://www.bbc.co.uk/monitoring/yemens-abd-almalik-alhouthi. Abdel Malik Al HouthiAhmed Mamdouh, “Abdul Malik Al Houthi: The Shiite Thorn on Yemen’s Side,” AlBawaba (Egypt), March 25, 2015, http://www.albawabaeg.com/52258. Abdel-Malek al-HouthiTom Finn, “Abdel-Malek Al-Houthi: from Shadow Rebel Leader to Kingmaker,” Middle East Eye, September 26, 2014, http://www.middleeasteye.net/in-depth/features/abdel-malek-al-houthi-shadow-rebel-leader-kingmaker-988988591. Abdul Malek al-HouthiReuters, “Countries Backing Shaky Yemen Transition Warn Houthis Against Violence,” New York Times, August 19, 2014, http://www.nytimes.com/reuters/2014/08/19/world/middleeast/19reuters-yemen-houthis.html. Abdel-Malik al-HouthiKareem Fahim, “Yemen: Houthi Leader Is Open to Talks,” New York Times, May 20, 2015, http://www.nytimes.com/2015/05/21/world/middleeast/yemen-houthi-leader-is-open-to-talks.html?_r=0. Abdulmalek al-HouthiSaeed Al Batati, “Who are the Houthis in Yemen?,” Al Jazeera, March 29, 2015, http://www.aljazeera.com/news/middleeast/2014/08/yemen-houthis-hadi-protests-201482132719818986.html. Abdulmalik al-HouthiSecurity Council, “Security Council Demands End to Yemen Violence, Adopting Resolution 2216 (2015), with Russian Federation Abstaining,” United Nations, April 14, 2015, http://www.un.org/press/en/2015/sc11859.doc.htm. Abdul Malik al Houthi“Treasury Sanctions Instigators of the Violent Takeover of Yemen,” U.S. Department of the Treasury, April 14, 2015, http://www.treasury.gov/press-center/press-releases/Pages/jl10021.aspx. Abdul Malik Badruddin Ameerudin Hussain al-Houthi“Treasury Sanctions Instigators of the Violent Takeover of Yemen,” U.S. Department of the Treasury, April 14, 2015, http://www.treasury.gov/press-center/press-releases/Pages/jl10021.aspx. Abdulmalik Bin Bader Al-Deen al-Houth“Treasury Sanctions Instigators of the Violent Takeover of Yemen,” U.S. Department of the Treasury, April 14, 2015, http://www.treasury.gov/press-center/press-releases/Pages/jl10021.aspx. Abu Jibril“Yemen’s Abd-al-Malik al-Houthi,” BBC News, October 3, 2014, http://www.bbc.co.uk/monitoring/yemens-abd-almalik-alhouthi. The U.N. Security Council designated “Abdulmalik al-Houthi” on April 14, 2015, imposing an asset freeze, travel ban, and arms embargo.Security Council, “Security Council Demands End to Yemen Violence, Adopting Resolution 2216 (2015), with Russian Federation Abstaining,” United Nations, April 14, 2015, http://www.un.org/press/en/2015/sc11859.doc.htm. The U.S. Department of the Treasury designated “Abdul Malik al-Houthi” as a Specially Designated National (SDN) on April 14, 2015.“Treasury Sanctions Instigators of the Violent Takeover of Yemen,” U.S. Department of the Treasury, April 14, 2015, http://www.treasury.gov/press-center/press-releases/Pages/jl10021.aspx. “We could target Saudi oil tankers and we could do anything.”“Yemen's Houthi leader says could target Saudi oil tankers if Hodeidah attacked,” Reuters, September 14, 2017, http://www.reuters.com/article/us-yemen-security/yemens-houthi-leader-says-could-target-saudi-oil-tankers-if-hodeidah-attacked-idUSKCN1BP2AF?il=0. “All companies (working) in the UAE should no longer see it as safe.”Ahmed Al-Haj, “Yemeni rebel leader threatens attacks on UAE territory,” Associated Press, September 15, 2017, https://apnews.com/5d9be93fdaa541b68e632c7af9a62d1b/Yemeni-rebel-leader-threatens-attacks-on-UAE-territory. “Your bet on the Yemenis is proper. ‘Israel’ must beware the Yemeni participation in any of its military confrontations with Hezbollah or the Palestinian re[s]istance.”“Sayyed Houthi to Sayyed Nasrallah: Yemenis Ready to Join Hezbollah Fight against ‘Israel’ during Any War,” Al Manar TV, July 20, 2017, https://english.almanar.com.lb/308218. “[U.S. President Donald] Trump’s trip to Riyadh is in line with implementing the US and Israel's plots to annihilate the Arab states after weakening and disintegrating them. Saudi Arabia and the UAE are financial sponsors of these plots and when their role ends, it will be their own turn to become annihilated by poverty.”“Abdul-Malik al-Houthi: Trump's visit to Riyadh aimed at helping Israel,” AhlulBayt News Agency, May 21, 2017, http://en.abna24.com/news/middle-east/abdul-malik-al-houthi-trumps-visit-to-riyadh-aimed-at-helping-israel_831055.html.